What seems like an ordinary day at the Masaki household soon changes for the worst. While trying to avoid yet another argument between Ryoko and Ayeka, Tenchi walks near the Masaki Shrine and completely vanishes. Six agonizing months pass, and the Masaki clan are still continuing their search. However, they soon discover that Tenchi is trapped in another world with a mysterious woman named Haruna. Even worse is the fact that Tenchi seems to have completely forgotten about his friends. 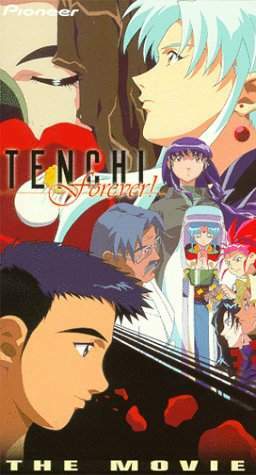 In this new life, Tenchi is an artist, struggling to capture the image of a woman who keeps appearing in his mind. Ryoko and Ayeka continue to attempt to get Tenchi's memories back and free him from Haruna. However, Tenchi's new existence is merely an illusionary prison, created from an important person from Yosho's past. After avoiding another argument between Ryoko and Ayeka, Tenchi wanders in the forest near the Masaki Shirine - and disappears! Now the Masaki clan is spead out in order to find him - Sasami and Ryo-Ohki at Jurai, Mihoshi and Kiyone at the Galactic Science Acadamy, Washu monitoring at home while Ryoko and Ayeka travel thru Japan. What they all discover is a remant of an old love of Yosho's that is holding Tenchi in a make-believe world and they must get him out of there - but will Tenchi want to come back?